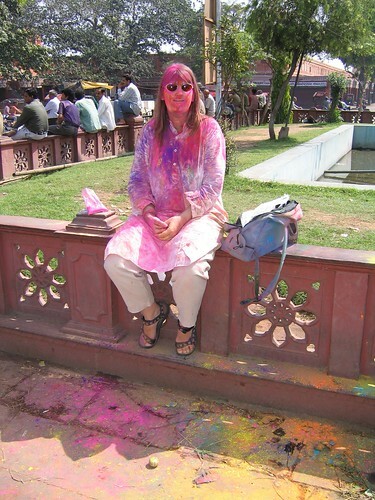 Two weeks ago we were in Jaipur, India, during Holi, India’s festival of color that marks the beginning of spring. The day before we had attended the wonderful Elephant Festival and we had already bought a few bags of color from a street vendor, so on the morning of 14 March we headed into the city, each armed with bags of colored powder in our pockets. Ready for our first Holi. Street vendor selling Holi colorsWe had heard from other tourists that it can be overwhelming to go out on the streets during Holi in India; we read reports of westerners ambushed by over-enthusiastic Indian Holi celebrators, thus it was with caution that we left our hotel and headed for the Pink City. We walked for about an hour, and on the way we saw locals covered in colors — mostly pink — walking about, and riding around on motorcycles and rickshaws, but there were also lots of (still) clean people as well. The first few groups of children and young men we met were careful in their approach and would smear colors on our face and hair when they would notice our colored hands. Some small children would reach up to our face with their pink or yellow hands, and we needed to bend down to allow them to put it on. That was cute. Then we entered the old city through one of the impressive gates, and there were larger groups of kids. A few times they would ask if they could play Holi on us, and we would agree, but then they would get a bit rough and we had to tell them to stop and we would have to make a run for it. Another time small kids approached us with wet black hands and arms, and by this time we were already well-covered in colors, so it was no use pretending we were not participating in Holi. Two of the kids came to me and covered my arms completely in what looked to me as ink, so I was worried I wouldn’t be able to wash it off (it wasn’t ink, and it came off okay later). But, I didn’t have much time to think about it as armies of small children were standing on nearby rooftops, shooting at us with water pistols, filled with colored water, of course. We fled to the middle of the street, just outside their range. Na-naaah!! After a while we came to a large roundabout named Choti Chaupar, which had a small square garden in the middle, ringed by a low stone fence. Each of the four corners was packed with a dozen riot policemen (I guess the festivities do get out of hand sometimes). We decided to sit on one side of the fence and watch the traffic with colored drivers go by. We sat there for about an hour, and ‘surprisingly’ we were not attacked. Mmm, I wonder if the armed soldiers nearby had anything to do with that. 😉 On the contrary, this time adult men would come up to us and ask us questions, like Where are you from? 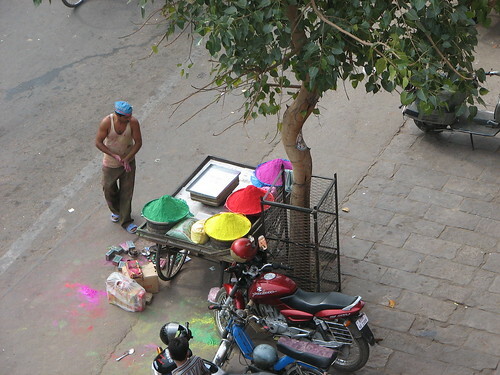 and Do you like Holi?, and then they would ask us permission to put color on. When I started to cough up pink powder we decided to go back to the hotel. We left the remaining bags of powder on the fence and called for a rickshaw. Back at Arya Niwas hotel they didn’t was us to color up the room, so they made us pre-wash in the small toilet sink behind the reception. We did the best we could, but still looked like we just survived an explosion at a paint factory. So instead of walking up to our room with colored powder on us, we were now dripping color all over the place before we got to our room. I still had color coming out of my ears one week later, but it was a great experience. We found the locals to be very friendly and polite; even when we were completely covered in powder and it was obvious we were into the whole Holi experience, they would politely ask us if they could smear us with even more. Totally not what we had expected. This entry was posted on Friday, March 31st, 2006 at 12:10 pm CET and is filed under Personal, Travel	with tags . You can follow any responses to this entry through the RSS 2.0 feed. You can leave a response, or trackback from your own site. Hi! You really have an interesting blog. I like your pictures smeared with different colours. 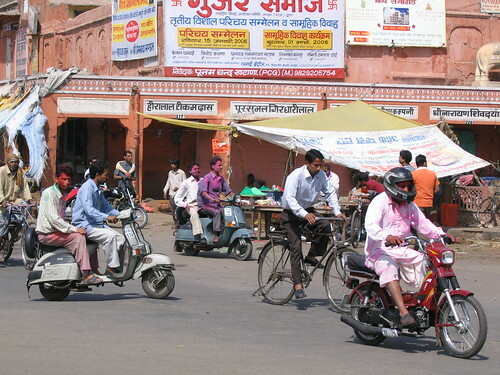 Rajasthan is really a delight to visit. I have visited Jaipur a number of times. It’s really a wonderful city with handicraft-laden markets. Was just reading your Holi article.. sounds like you got lucky that the majority of people asked your permission first before colouring you! 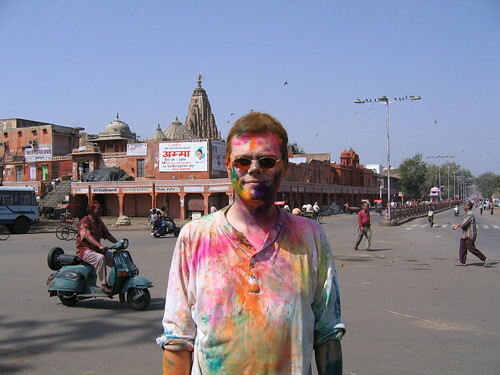 I am living in India, and my family and I are going to go to Jaipur for Holi, so naturally I found this post interesting. Thanks for the prep!